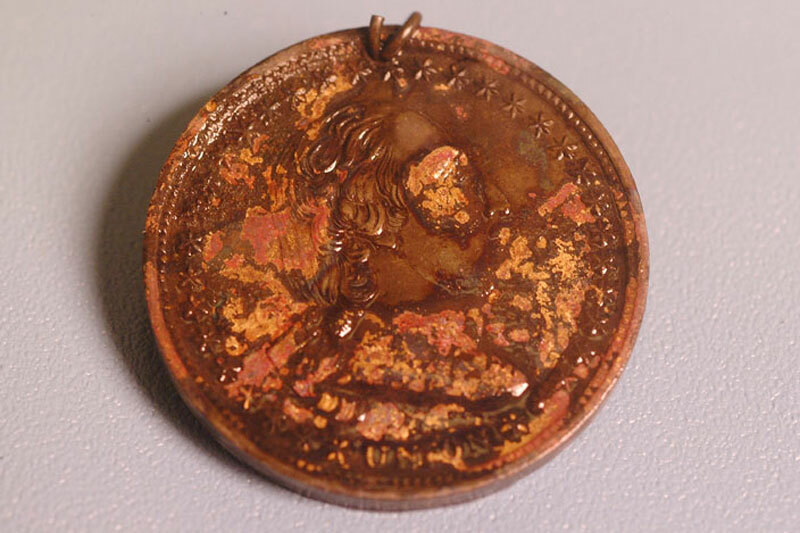 According to legend, Hunley Captain George Dixon was given a $20 gold coin by his sweetheart when he left for war. During the Battle of Shiloh, Dixon was shot. The bullet struck the coin in his trouser pocket, absorbing the impact of the shot and sparing his life. Countless legends are born during war, but few are ever proven. For 137 years, no one knew whether the story was a historical fact or a romantic tale passed from generation to generation. 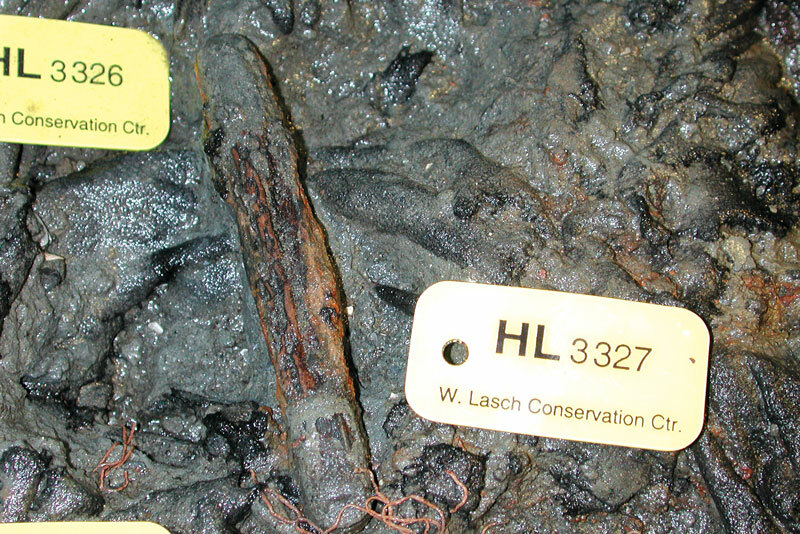 In 2002, Hunley scientists discovered a diamond ring and brooch while sifting through sediment excavated from Dixon’s station. The jewelry was found between two layers of waterlogged cloth, meaning he most likely carried the pieces in his vest pocket. The gold ring holds 9 diamonds weighing together approximately 1 carat. 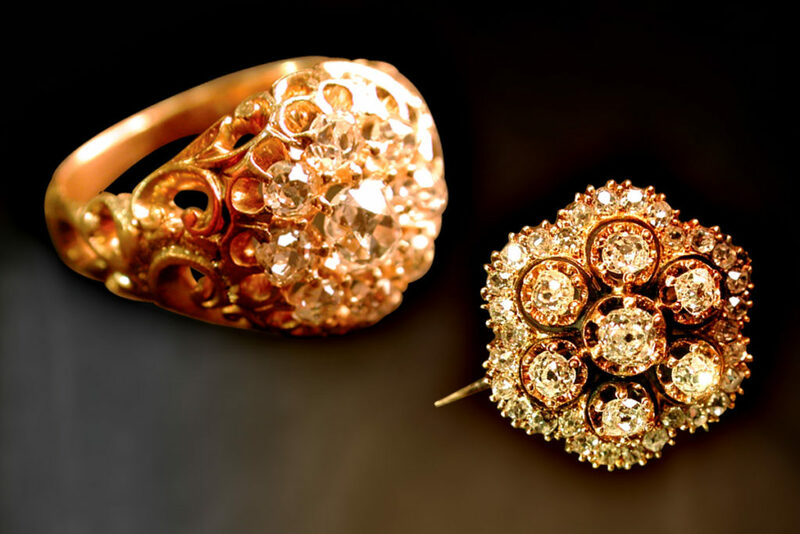 The gold brooch has 37 small diamonds amounting to about 2 carats. The diamond jewelry would have been extremely valuable, particularly during war time, meaning he could have been carrying them for safe-keeping. 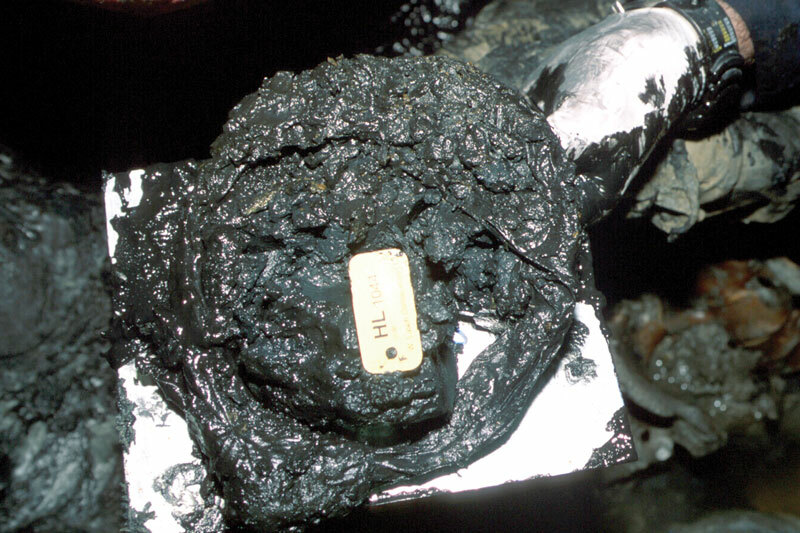 In April, 2001, a Union identification tag was discovered on the Confederate submarine, opening the door to much speculation. The tag bears the name Ezra Chamberlin with the 7th Connecticut Infantry. 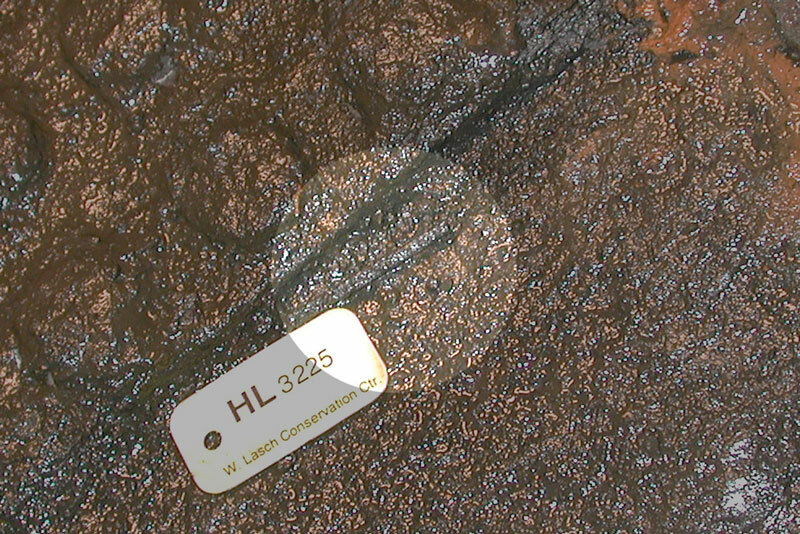 The mystery became more intriguing when scientists learned Chamberlin’s body was not at the site in Connecticut where a headstone commemorates his life. Did Ezra switch sides or was he a Union spy? Was he a prisoner of war forced to help power the dangerous submarine? Ultimately, this mystery was solved when DNA identification with a descendant confirmed the crewmember wearing the ID tag was not Pvt. Chamberlin of Connecticut, but Joseph Ridgaway of Maryland. Both gentlemen fought—on opposing sides—at the battle on Morris Island in 1863. Records indicate Chamberlin died at this battle, body unrecovered. 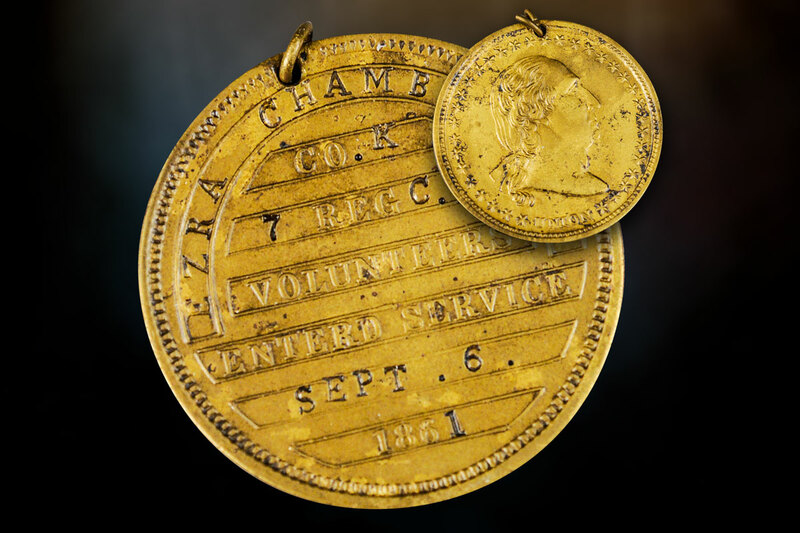 The ID tag could have been a battlefield souvenir or may have been given to Ridgaway so it could be safely returned to Chamberlin’s family after the war. A signal light has long been a central event in the unsolved mystery of the Hunley’s disappearance. Hunley lore and historical records indicate the crew was to signal if they achieved their mission to take down one of the Union ships blockading Charleston harbor. Confederates on land would then light a fire to help guide the Hunley safely back to shore. 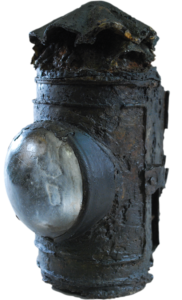 Whether this lantern found in the crew compartment was used to signal or not is a matter of historical debate. Still, this fascinating artifact was so deteriorated, it is remarkable the lantern survived at all. It took conservators years of expertise—and patience—to save this extremely delicate piece of maritime history. 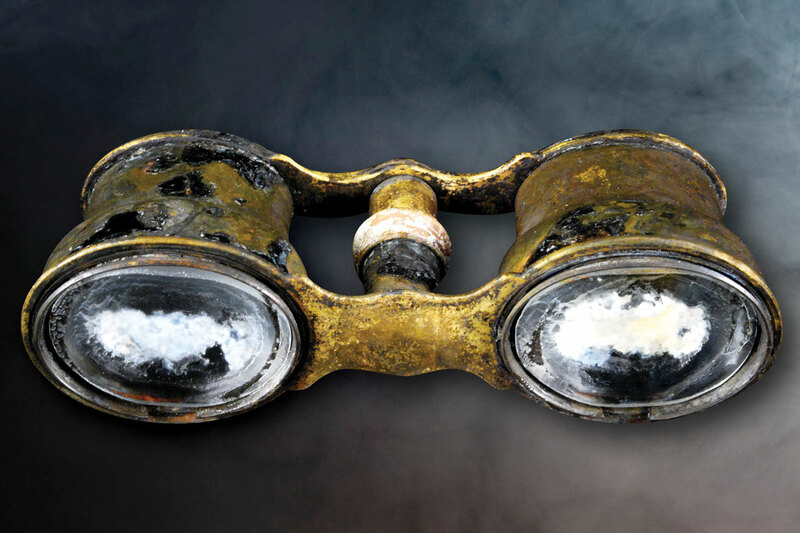 As Captain of the Hunley, Dixon’s binoculars were a critical tool. While still on land, he would use his binoculars to survey the Union blockade and select the best target. While commanding the submarine, he likely opened the forward hatch periodically to give the crew fresh air. Dixon no doubt took this opportunity to stick his head out through the conning tower and use the binoculars to help gain his bearings. 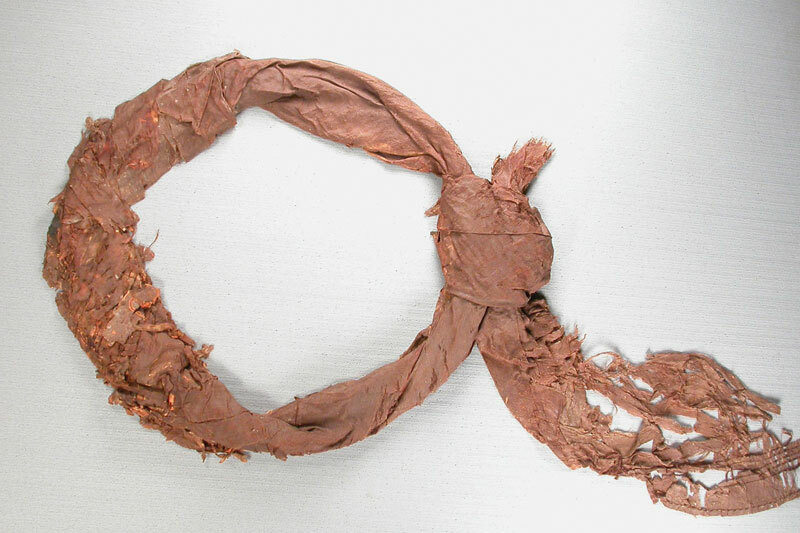 By working closely with Mary Ballard, Senior Textile Conservator for The Smithsonian Institution, the Hunley team was able to beautifully conserve this silk bandana worn around the neck of crewmember James Wicks. Two small Navy buttons with fouled-anchor motif found in Arnold Becker’s position. 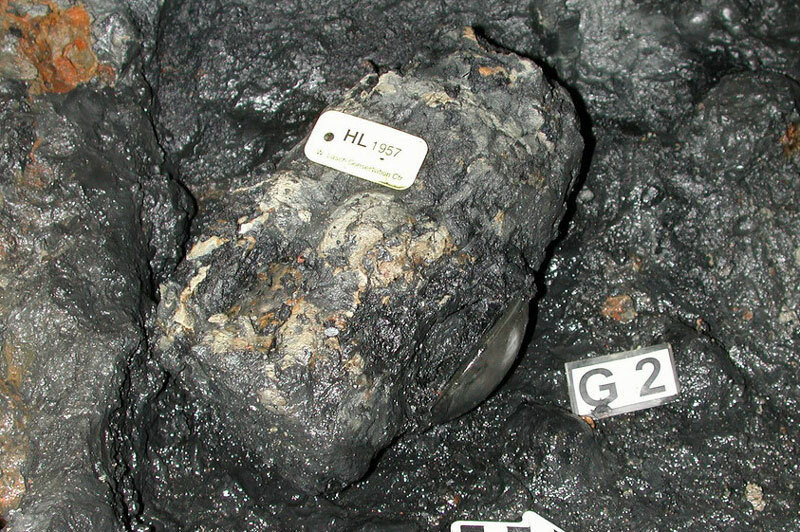 Eight canteens were found onboard the Hunley. 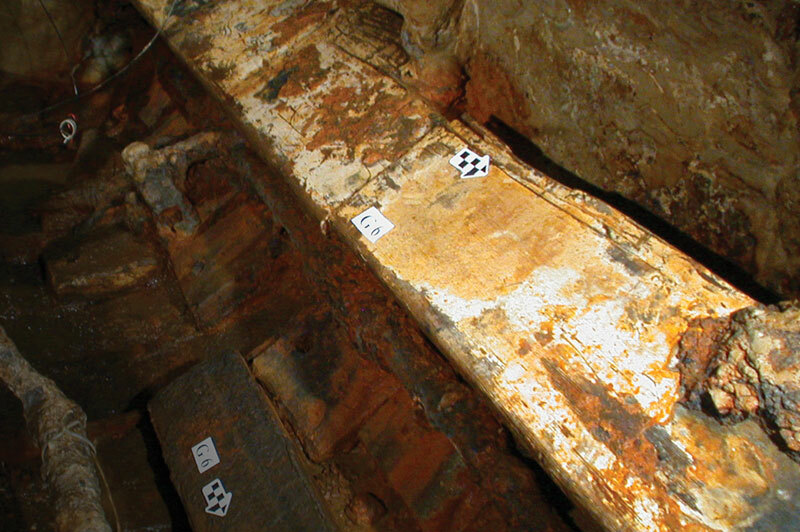 Though many have speculated they held “liquid courage” to help the crew handle such dangerous and cramped conditions, archaeologists say that is very unlikely. Cranking the submarine was grueling work and the crew would have needed to stay hydrated to perform their duties. Chances are, the canteens all held water. At most, one was perhaps filled with spirits for celebratory toast in anticipation of a successful mission. 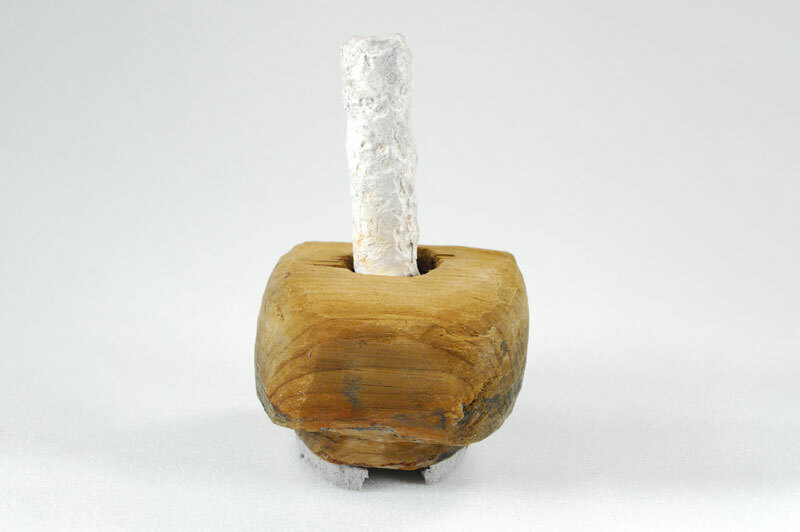 with the cork and rope. 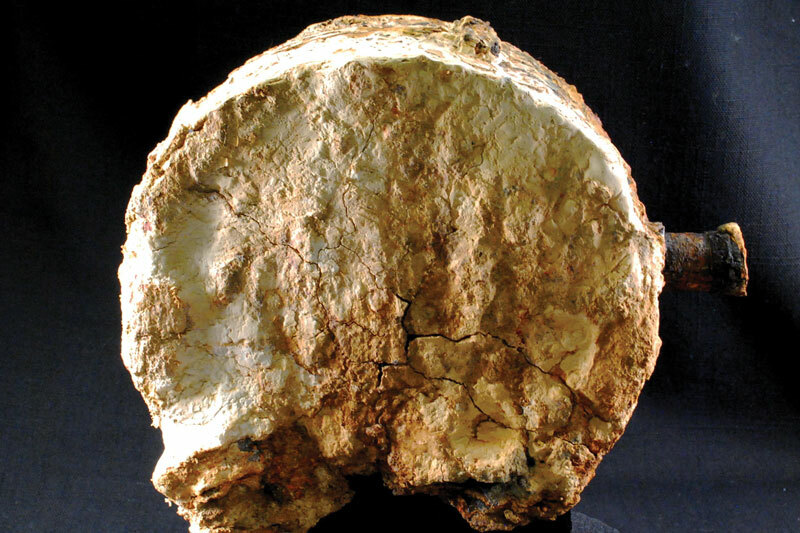 Finally, the object was placed in a domestic freezer for about two more years to let the rope and cork dry very slowly. 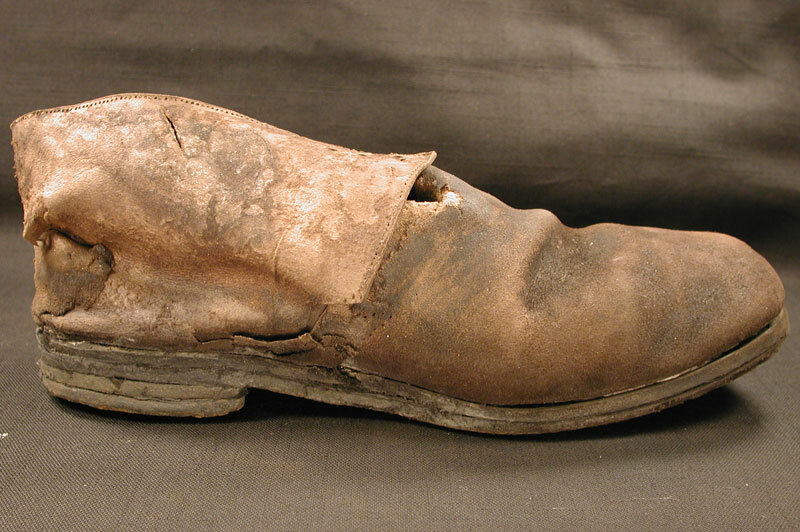 Sixteen shoes belonging to the eight-man crew were excavated between 2001 – 2002. 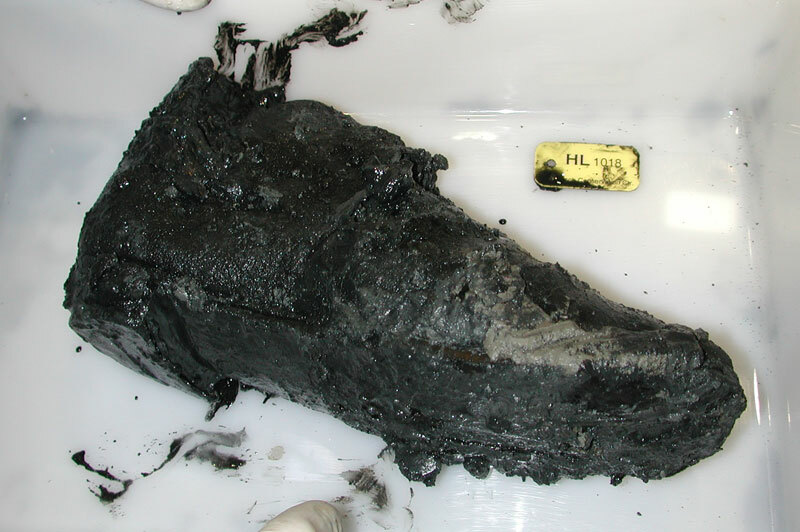 In some instances, the shoes were literally encapsulated by iron cement and required an enormous amount of time to free them from the submarine’s hull. Waterlogged leather is well-known for its instability when exposed to the atmosphere without a proper conservation treatment. 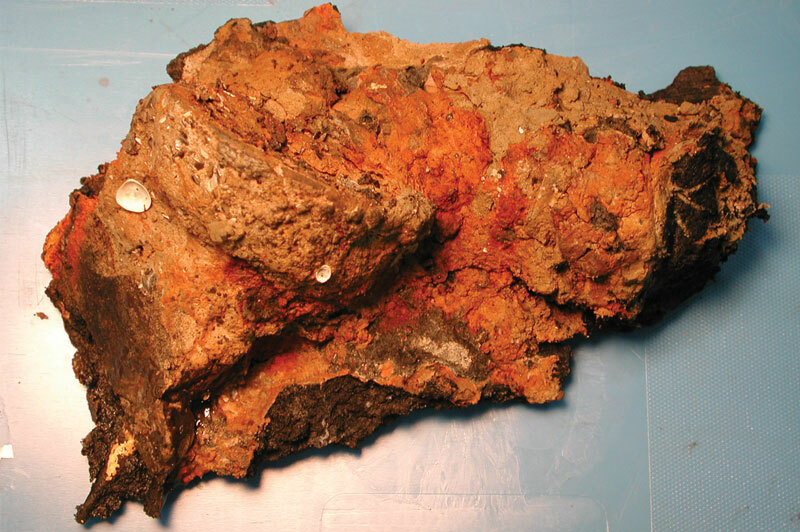 The artifacts required careful handling and treatment since the majority of the shoes were in an advanced state of deterioration and showed various degrees of iron staining when they were removed from the submarine. 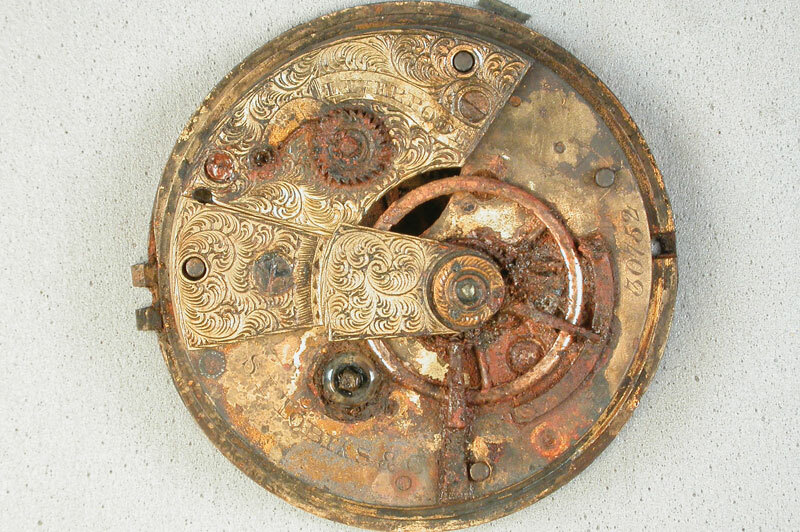 When Hunley Commander Lt. George Dixon’s pocket watch was discovered during excavation, archaeologists were eager to open it and learn the time displayed on the dial in hopes it would provide an important clue in their efforts to solve the mystery of the Hunley’s disappearance. However, the study of the watch needed to be closely coordinated with conservators to ensure the watch was not damaged. 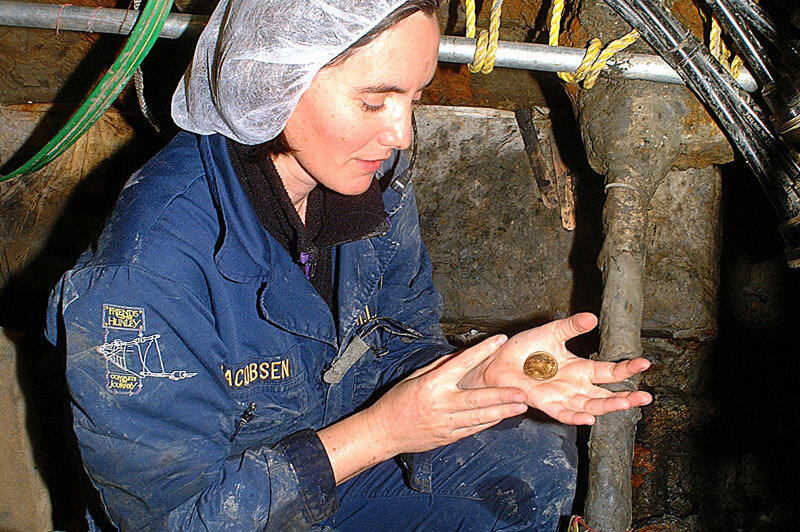 “Dixon’s gold pocket watch is a perfect example of the need for collaboration between archaeologists and conservators,” said Hunley Project Senior Conservator Paul Mardikian. 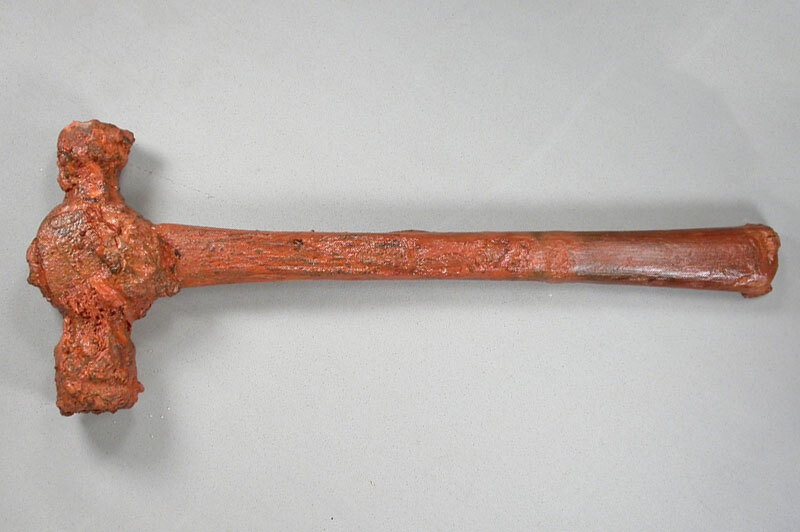 A detailed x-ray analysis was conducted before the artifact was touched. The watch’s gold casing was relatively easy to stabilize. But its internal movement and time display were a different story. They are made of a variety of materials — including steel, paint, porcelain, and brass — all of which required different and very specific conservation treatments. Given the complexity of the watch’s design, conservators decided the best approach was to disassemble it and preserve each section separately. Dissecting the small watch proved extraordinarily difficult. “Conserving the pocket watch was like brain surgery. It required a good plan and steady hands,” Mardikian said. First, the crystal face was removed and the time dial separated from the movement. 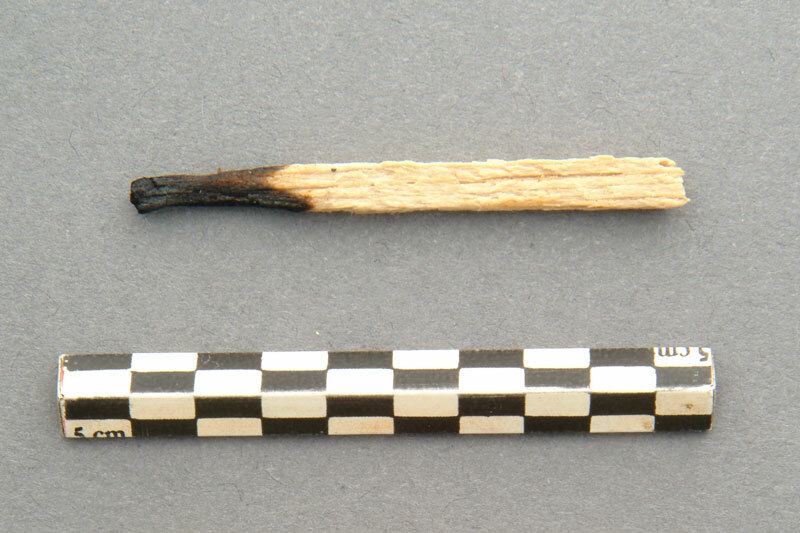 Next, all of the tiny items were conserved one by one, and then re-assembled with extraordinary precision. 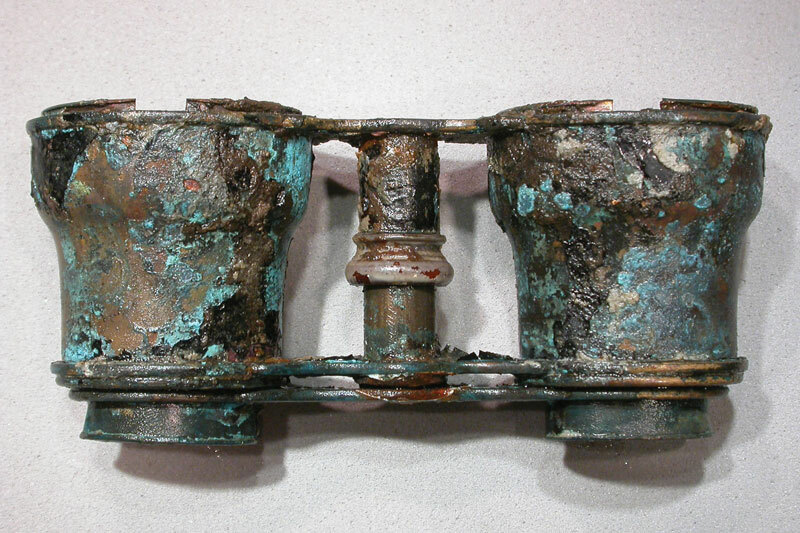 Thanks to Hunley conservators, Dixon’s elegant watch is a beautifully preserved artifact and can still serve as an ongoing resource for discovering the events that transpired the night of the Hunley’s historic mission. 1-inch pine boards, measuring approximately 18-feet long combined. The wood was waterlogged and heavily stained with corrosion. 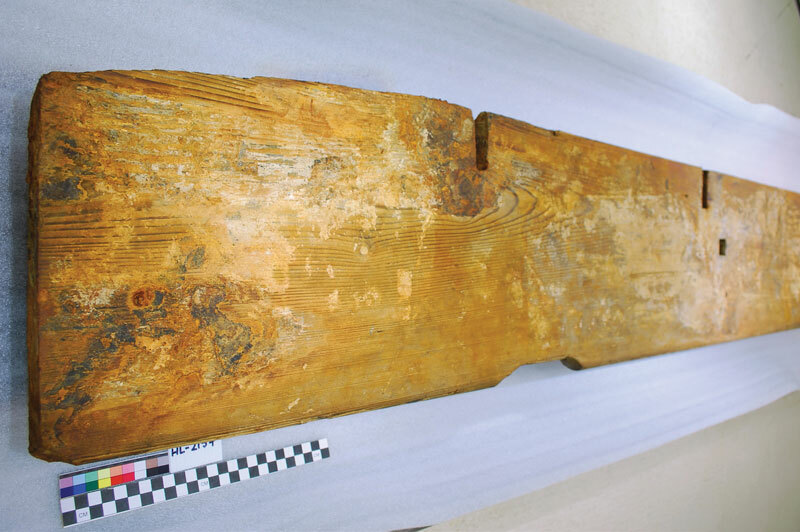 Examination revealed that the bench was originally painted white, a rare find on wood in this condition. One of the most difficult technical challenges faced by the conservators was finding the right balance between the removal of iron stains and the preservation of the remnants of the original paint. The treatment of the bench was a lengthy process that included cleaning to remove surface dirt. 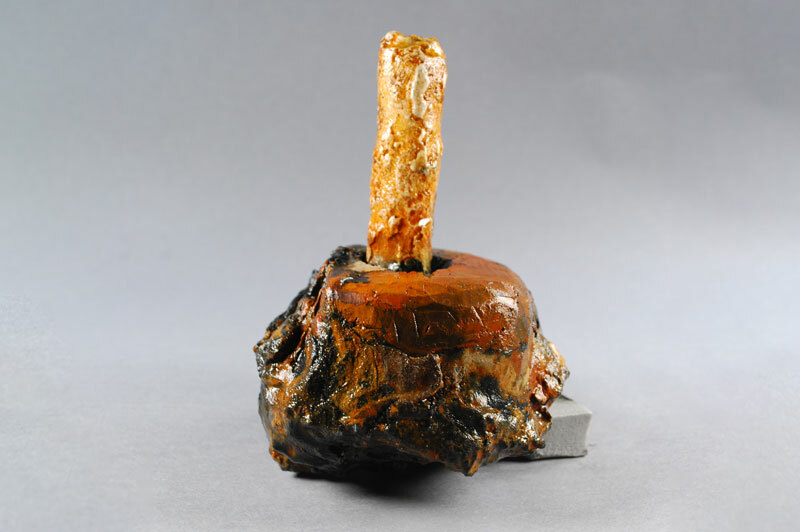 Then, it was soaked for several years in Polyethylene Glycol (PEG), a synthetic, water-soluble wax. During the conservation process, the wax slowly permeated and provided support to the degraded wood cells so they could undergo freeze-drying, the critical final step in the conservation process. 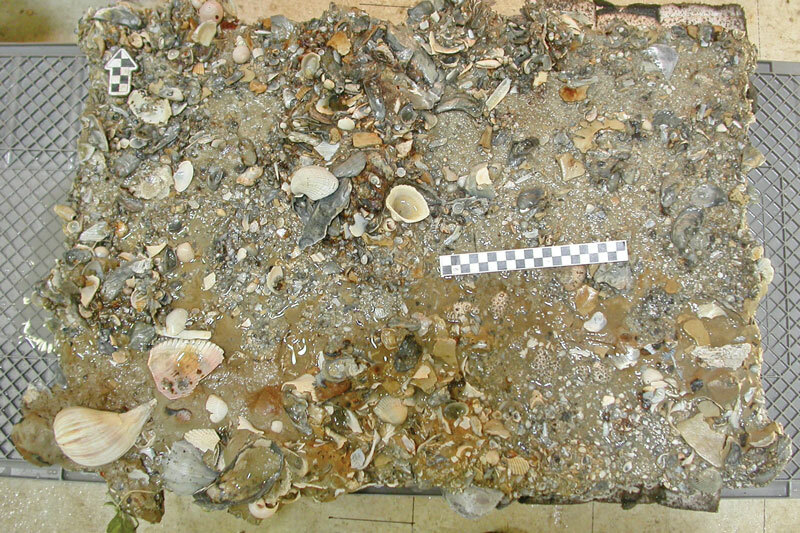 The bench was dried at the Maryland Archaeological Conservation Lab at the Jefferson Patterson Park and Museum, which has a much larger freeze-dryer than the Hunley lab. During the final stages of drying, which took approximately one month, the wood lost about 50 percent of its waterlogged weight. 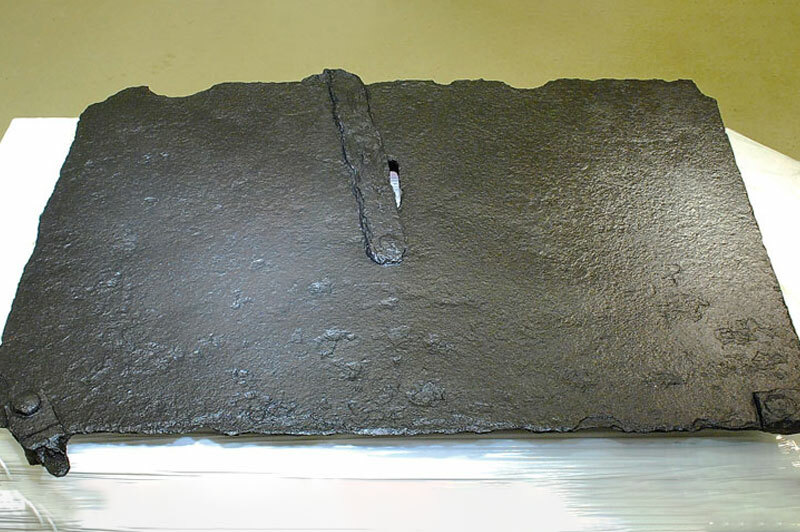 Now complete, amazing details such as possible textile imprints left by a crew member’s pants when the paint was still fresh were preserved. The Hunley was a metal submarine with dozens of moving parts that were regularly submerged in saltwater. 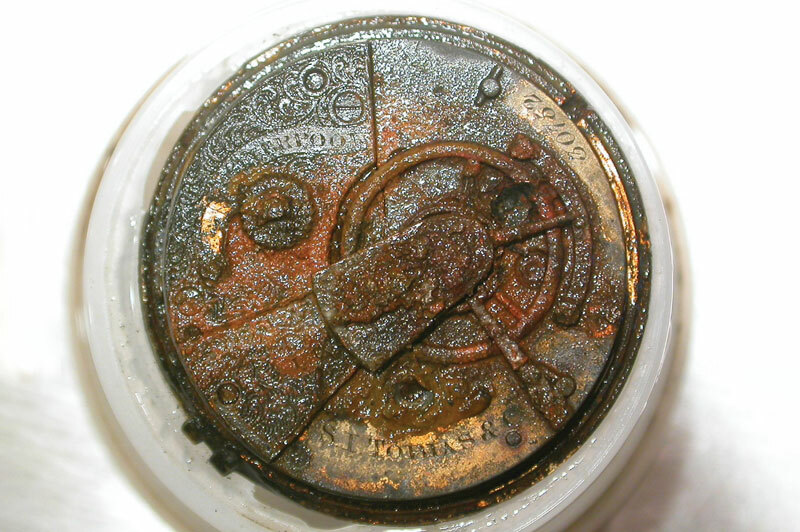 Flash rusting was a constant threat and the machinery needed to remain well lubricated to operate properly. This made the oilcan found in the crew compartment a necessary maintenance tool. 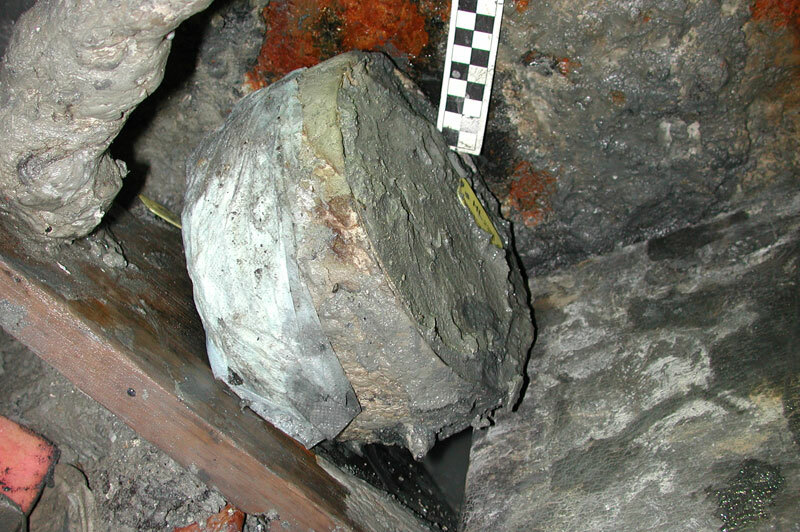 When conservators began work on the oilcan, the spout and well (or canister) were held together only by a thick layer of concretion. They detached the two pieces, and were amazed to find the well still held oil from the 19th century. 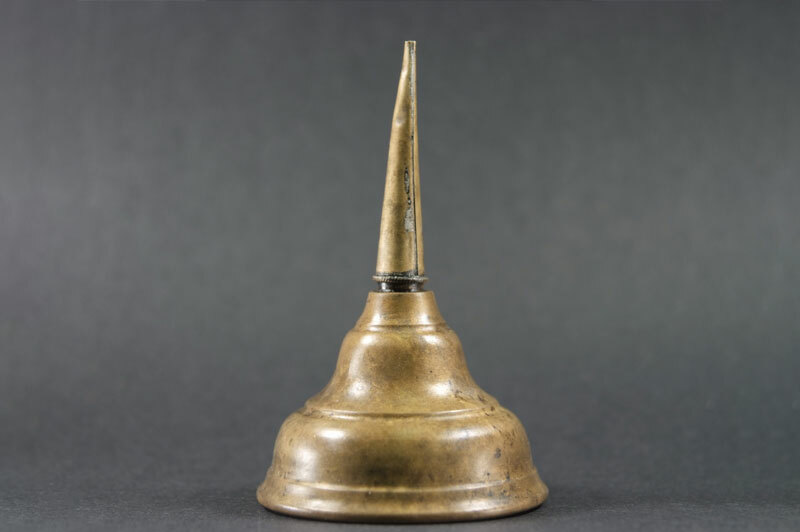 Once completed, conservators reattached the spout to the well, restoring it as closely as possible to its original appearance. Now, the once unrecognizable oilcan is a stunning example of the magic of conservation. To explain the complications his team faced, Mardikian offers an interesting analogy. Envision taking an egg, draining the interior yolk, and then dipping the hollow shell in cement. Give it several days to dry in the sun. “Now, try to imagine removing the cement casing, but without breaking the egg shell. Then, think about trying to do it by hand. That is basically what we were facing,” Mardikian said. Working under a microscope, conservators slowly removed the layer of concretion surrounding the suspenders with a hand-held instrument dentists often use to drill cavities. The painstaking work was slow and stressful. One slip of the hand could destroy an irreplaceable piece of history. Fortunately, they were able to safely complete the delicate project. 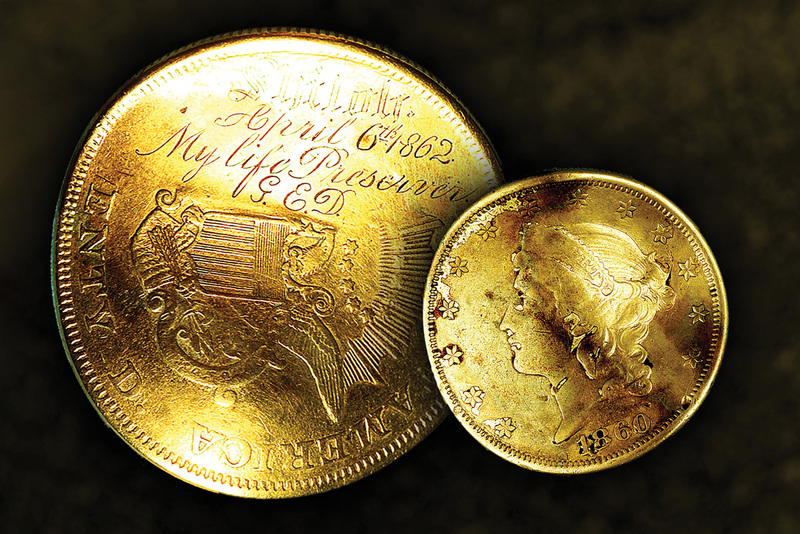 Dixon was a man of at least moderate wealth, and carried with him many treasures. 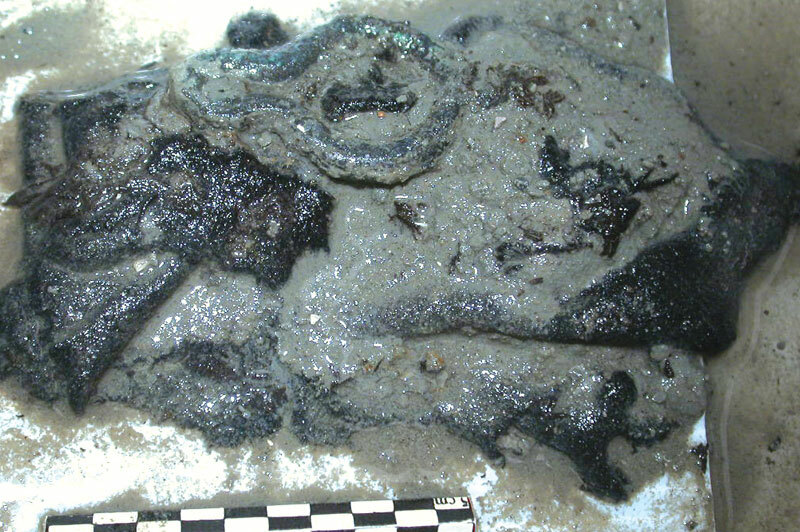 Among them was a $20 dollar gold piece, diamond jewelry, and what initially appeared to be a silver and antler pocketknife. At first, conservators were surprised that silver — a valuable metal during the Civil War— survived so well in the submarine. 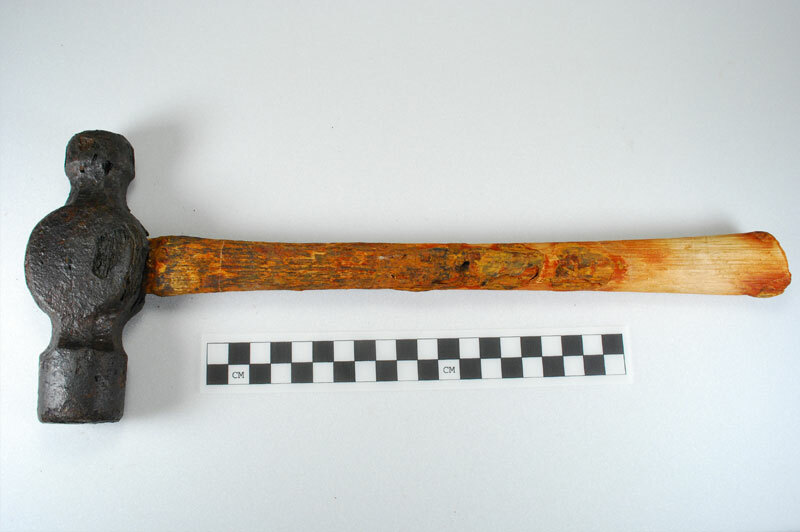 Since the knife is a composite artifact (meaning it is made of numerous materials), conservators used a portable XRF analyzer to help identify the composition of each element before planning a way to preserve it. The scanner detected only copper and nickel at the sections that looked like silver. Commonly referred to as German Silver, this alloy was durable and cheaper than real silver. 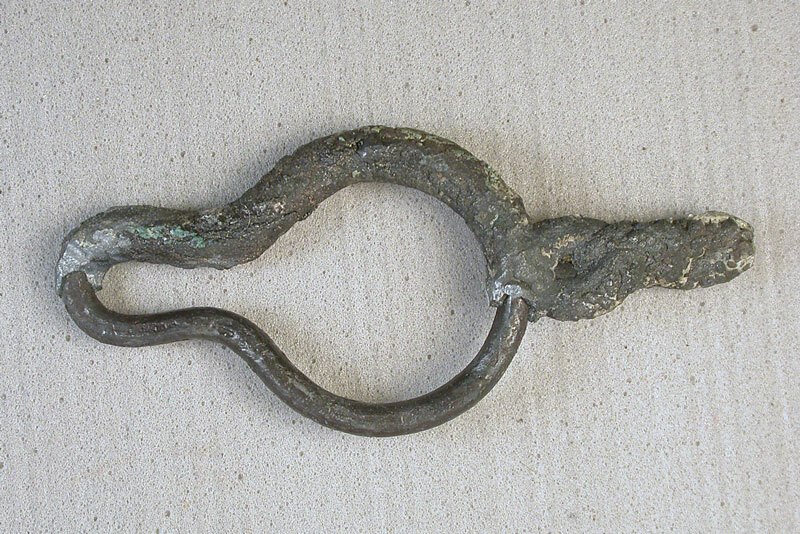 Archaeologists speculate Dixon, a man of refined tastes, was perhaps unaware his handy pocketknife was not made of genuine silver. 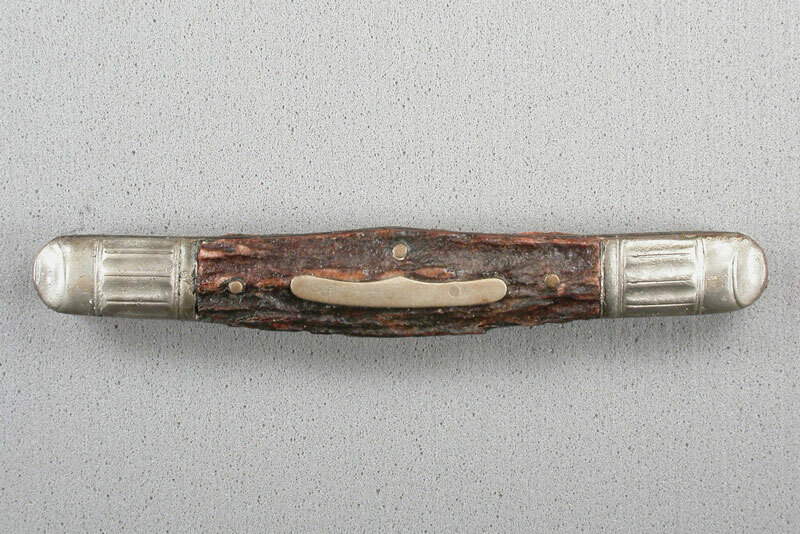 knife has nearly the same appearance it had when Dixon carried it aboard the submarine in 1864.